As women age, their chances of becoming pregnant get smaller1. According to the American Society for Reproductive Medicine, over half of women over 40 have fertility problems. Many scientific studies have also shown that the risks associated with pregnancy to both mother and baby are higher in older women2, 3. These statistics can be very disheartening for women trying to have a baby. It is important to remember that there also many success stories where women over 40 have had healthy pregnancies. By ensuring that you follow medical advice and take the appropriate precautions, the risks associated with having a baby later in life can mostly be successfully managed. The chances of becoming pregnant get smaller with each year that passes. The odds of getting pregnant when you are 40 (8% monthly chance of conception) are much higher than they are when you are 44 years old (4%). This appointment is very important so that the doctor can ensure that your body is ready for pregnancy. A range of health issues can be identified and appropriately dealt with such as obesity, diabetes, high blood pressure (also called hypertension), depression, polycystic ovary syndrome (PCOS), endometriosis, sexually transmitted diseases (STDs) and other potential fertility issues. Your doctor can also recommend a diet and exercise plan. This can promote fertility and help strengthen and prepare your body for the demands of pregnancy. Being unhealthy can increase your risk of experiencing complications during and after pregnancy. This is in addition to the already heightened risk due to a higher maternal age. It is important that you do as much as you can to improve your own health to give yourself the best chances of having a successful pregnancy, including managing your weight 4 and making sure that you quit smoking5. The risks associated with becoming pregnant after the age of 40 are serious for both the baby and the mother. It is important that you make sure you are aware of the risks. The purpose of the following information is not to scare you, but to make sure that you fully understand the possible consequences of pregnancy. It is not a decision to be taken lightly. 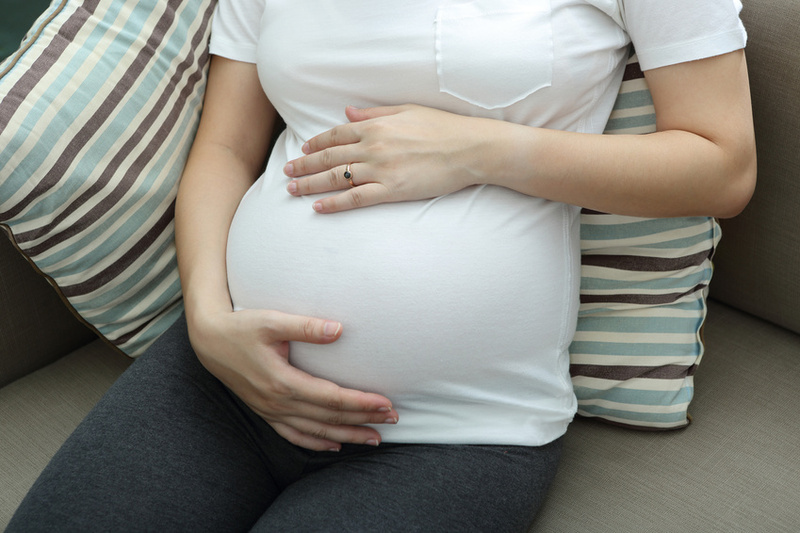 Pregnancy involves many physical changes occurring within a woman’s body. As a woman ages, the body gradually becomes less physically fit for pregnancy. This can make conceiving difficult, and it increases the risk of complications. Women over the age of 35 are more likely to develop gestational diabetes, hypertension, pre-eclampsia, placental abruption, placenta previa or an ectopic pregnancy. It is common for women over the age of 40 to be put on mandatory bed rest for the last weeks of their pregnancy, to reduce the strain on their body as much as possible. Also, in older mothers it is more likely that a Caesarean section (also known as a C-section) will be performed during delivery6. Women over 40 years of age are more likely to give birth to foetuses with chromosomal abnormalities than younger women7. Chromosomal abnormalities can lead to birth defects and genetic disorders such as Down’s syndrome. Women over the age of 45 have a 14 in 1,000 chance of giving birth to a child with Down’s syndrome. Genetic tests are available to detect some chromosomal abnormalities before the pregnancy comes to term, but you need to consider the moral implications of finding out this information. The rate of stillbirths and miscarriages is also significantly higher in women over the age of 40. It is important to make sure you follow the guidelines for proper prenatal care to reduce the risk of giving birth to premature and underweight babies. Modern medicine has helped many more women over the age of 40 to have healthy and successful pregnancies. The following are some of the most effective and well-known artificial fertility treatments available. These medicines will stimulate a woman’s reproductive hormones to trigger the release of more follicles during her menstrual cycle. This treatment can result in twins or even more babies because multiple follicles (eggs) may be released. Treatment usually lasts 3 to 6 months. If a woman still has not become pregnant after this, the fertility specialist may decide that a different treatment is needed. Fertility medications are 20-60% effective. Sometimes the method is combined with artificial insemination to boost the success rate. Oral medications are the most affordable option. Injections are another option. Some of the side effects include hot flashes, cramping, bloating, vaginal dryness and headaches. Learn more about costs of fertility mediations from a clinic near you. If a woman has certain reproductive health issues which affect her ability to conceive, surgery may be an option. Surgery can fix a number of problems including blocked fallopian tubes, endometriosis, fibroids, ovarian cysts and help reduce genetic defects. When a woman undergoes surgery for endometriosis or scar tissue her chances of conceiving a child increase to 40-60%. Hysteroscopy surgery that clears blocked fallopian tubes has more varying results which range from 10 to 90% success rate in conceiving. The cost of surgery depends on a number of factors including insurance, the specific operation, and where you live. Learn more about costs of surgery from a clinic near you. The most common type of artificial insemination is intrauterine insemination (IUI) in which a catheter is used to inject a concentrated sperm dose directly into the uterus. The sperm can be from a partner or a donor, and fertility drugs may be used alongside this treatment. The success rate is around 5-25%. A possible side effect is cramping, and discomfort when the catheter is being inserted. Learn more about costs of IUI from a clinic near you. This procedure involves a woman’s eggs being removed from her ovaries. The eggs are then fertilised by sperm cells in a laboratory, which results in the formation of an embryo. This is placed inside the woman’s uterus. Before this procedure, a woman may need fertility drugs to encourage egg cells to be released. The success rate of this treatment is between 28-35%. Learn more about costs of IVF from a clinic near you. In this procedure, the healthiest egg and sperm cells are injected together into a woman’s fallopian tubes. This procedure is slightly different to IVF as fertilisation of the egg cell actually occurs inside the woman’s body. However like IVF treatment, patients usually need to take fertility drugs before this procedure. The success rate is around 25% 8 to 35%. The recovery time from this procedure is a lot longer than with IVF. Learn more about costs of GIFT from a clinic near you. In this procedure, the egg and sperm cells are combined in a lab and fertilisation occurs. The fertilised egg is then surgically placed into a woman’s fallopian tube. Like other procedures, it is likely that fertility drugs will be needed during this process. The success rate can vary from 29% (8) to 35%. The recovery time from this procedure is a lot longer than that required for IVF. Learn more about costs of ZIFT from a clinic near you. This procedure involves a single sperm cell being carefully injected into an individual egg cell. This is then placed in a woman’s uterus. The sperm may need to be removed from the partner or donor using a needle or biopsy. This procedure usually results in only minor discomfort. The success rate is around 35%. Learn more about costs of ICSI from a clinic near you. This procedure does not involve the patient’s egg cells being used. Instead an egg is donated by another woman. This is mixed with a man’s sperm cells in a lab. The fertilised egg is implanted into the patient’s uterus. Choosing a donor for the egg can be a long, complicated and emotional process. However the success rate is quite high, at around 43%. Learn more about the costs associated with donor eggs and embryos from a clinic near you. This can be a difficult option for women, but in some cases it may be the best choice. This involves a donor carrying the embryo to term, but she then signs away her parental rights when the baby is born. This process can be very demanding for the mothers-to-be, as they obviously cannot completely control the donor’s behaviour during the pregnancy in terms of what they eat, drink, and the levels of stress they experience. Learn more about surrogacy in your location.